The opening Andante grave starts from nothing with a deep dark cello, as Elschenbroich colours the sound a burnished rich chestnut colour. It is a sombre and considered performance, with a lovely sung cello line in music which always seems touched with melancholy. There are moments of drama and some very striking pizzicato figures, but the ending is pure dream-like magic. It is a long movement which Elschenbroich and Grynyuk certainly have the measure of; surreal dreams might be the inspiration but they give a well structured performance. The finale, Allegro ma non troppo, has one of Prokofiev's long-breathed neo-classical tunes. 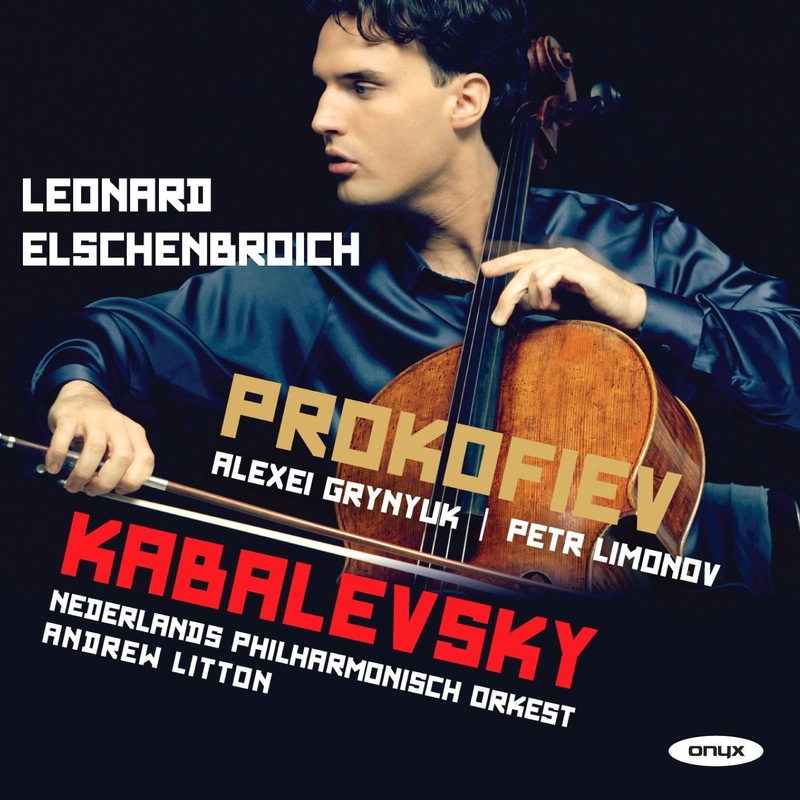 Elschenbroich gives a fluent and fluid performance with superb accompaniment from Grynyuk. You are again reminded that Prokofiev himself was a fine pianist and the piano part is far more than mere support. The music is highly restless, by turns skittering and magical or quietly considered. There is even a big romantic moment and finally, the work has a big finish. As if the composer has finally grasped his idea. The three short arrangements come from Prokofiev's stage works including the two ballets from the 1940's, a complement to the late piano sonata. Petr Limonov's own arrangements of the waltz from the Stone Flower and the famous march from The Love of Three Oranges, and Rostropovich's arrangement of the Adagio from Cinderella. All three are a delight, with the elegant waltz, the crisp swagger to the march and a fabulously sung adagio. Elschenbroich also plays another short piece, Dmitry Kabalevsky's Novelette. An elegantly melancholy work, it is one of the shorter pieces for which Kabalevsky is best known. But his Cello Concerto No. 2 in C Op. 77 is a big work dating from 1966. All Kabalevky's music, however, has been tarnished by his reputation for collaboration with the Soviet regime. Elschenbroich clearly feels that the music is well worth reviving and this white hot live performance of the concerto with Andrew Litton and the Netherlands Philharmonic Orchestra should win the work many friends. The shadow of Shostakovich hangs over the work in another sense too. Listening to it, I found myself coming back again and again to the way Kabalevsky's sound world echoes that of Shostakovich. It very much comes back to the fact that the two seem to use the same tonal palate, though Kabalevsky uses it to rather different purposes. The opening movement starts with a spare texture and plucked cello leading to a very Shostakovich-like sung tune. The intense development to which the music is subjected leads, rather surprisingly to a busy, yet edgy, scherzato section. But it doesn't last and the music finally evaporates, leading to a cadenza (intense and technically difficult rather than showy). This moves straight into the middle movement Presto marcato, which is fast and lyrical with fast passage-work yet with a melancholy tinge. The bombastic orchestral interruptions sound familiar, but there is no sense of savageness. The final movement starts off with a finely sung, very poignant passage before leading into a more agitated section. This might have a more romantic edge to it than the music of Shostakovich and perhaps be more traditional (in the mould required of the good Soviet Artist), but you also detect the same sense of anxiety. And Elschenbroich is brilliant both with the elegantly sung melody and with the fast skittering bits. Romantic this concerto might be, but it is certainly not Rachmaninov. Kabalevsky was clearly walking something of a tight rope, but Elschenbroich, Litton and the orchestra make a superb case for it. Buy this disc for some stunning cello playing, but buy it just as much for its thoughtful exploration of the world of the Soviet era composer.